Whether you’re a long-time home owner or you’ve just started shopping for your dream house, you’ve seen stacks of papers full of acronyms. Buried amid the dense undergrowth of legalese are three letters that could be costing you more than you think. 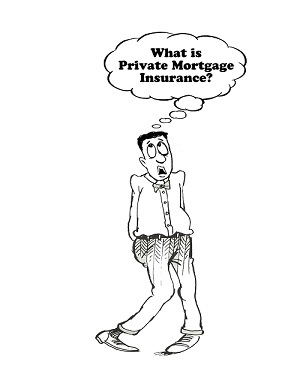 Be on the lookout for PMI: Private Mortgage Insurance. Close your eyes and imagine yourself as a venture capitalist, like those you may have seen on “Shark Tank.” An inventor comes to you and says they’ve got a killer new product. They need $300,000 now and they’ll repay it with 4% interest over the next 30 years. If they don’t, you can take the manufacturing equipment they’re going to buy with your loan, which is worth about $250,000. This isn’t a great deal for you – the venture capitalist – since you’re putting the remaining $50,000 on the line, and that’s not considering the cost of selling their equipment! They’re not risking anything. The equipment was bought with your money. You need to know they’ve got something at stake, too. So, they put up $30,000 of their own money. This is a better deal, but you’ve still got more to lose than they do. This is where an insurance company comes in and says that, for $3,000 a year, they’ll protect the loan. If the inventor fails to deliver, they’ll repay the balance of the loan at that point. Sounds great, but who’s going to pay it? If you do, that just raises the amount you’re going to lose on this deal. Instead, you make the inventor pay it. That’s how PMI works. The home buyer, in this example, is the inventor, and the lender is the venture capitalist. To make the mortgage an attractive option for lenders where scenarios like this happen, the home buyer needs a way to ensure the lender will be made whole (paid back in full) if something goes wrong. Importantly, PMI is protection for the lender, not the borrower. If you fail to make your mortgage payments, you will still face foreclosure even if you’re paying for PMI. All that changes is the institution that issued your loan can recoup its losses. Who has to pay for it? Not all mortgages require PMI. In general, loans made where the principal total is 80% or less of the sale price of the home don’t require PMI. If you put 20% down, lenders see that as a sign that you’re a safe risk. You’ve got as much skin in the game as they do. Home buyers with a down payment of less than 20% may have to pay for PMI. Typically, costs are between 0.5% and 1.0% of the total value of the loan, with riskier loans requiring higher PMI payments. Sometimes, lenders offer loans to these home buyers that exclude PMI, but in order to make the increased risk worthwhile, such loans come with a higher interest rate. PMI premiums can be made one of two ways. You may notice a line item in your mortgage estimate or statement that identifies your monthly premium for PMI. In other cases, it may be included with the closing costs as a lump sum. Some loans require both a payment at closing and an additional monthly premium. The 20% rule is a helpful one here, too. Once you’ve paid down enough of the loan to have 20% equity in your home (meaning your loan amount is less than 80% of the home’s market value), most lenders will no longer require PMI. Every month, a portion of your mortgage payment goes to paying interest, and a portion goes to paying the principal. The second part is how you increase your equity. Think of it as gradually buying your home back from the lender. Of course, you can make extra payments beyond the mortgage payment to reduce the principal faster and increase the percentage of home that you own. Even with a 20% stake in your house, you may have to pay for PMI a little longer. Policies are generally purchased for a year, and monthly payments are held in escrow to cover yearly premiums. You may have to continue paying the premium until the year in which you reach 20% equity ends. Also, if you happen to live in an area where home values have risen, investigate the ability to get a new appraisal if you are paying PMI. If your home has gone up in value enough to get you pas that 20% threshold, you may be able to request cancellation of the PMI on your loan. While PMI may seem unfair, remember that without it, lenders would be less likely to issue mortgages in the first place. PMI helps borrowers qualify for loans on homes they might not otherwise have been able to purchase. That means it helps put you in a nicer house without saving more for the down payment.